I love the flavor of creamsicle. Something about the creaminess mixed with the tartness of the orange is the perfect combination. For a while I only indulged in creamsicle in the form of a creamsicle popsicle from the ice cream truck in the summer. But who wants to wait for one time a year for that sweet creamy goodness?! I wanted to figure out a way to enjoy the flavor of creamsicle whenever I wanted and without all the sugar of a commercial creamsicle pop and my Creamsicle Smoothie was born. This smoothie recipe is very easy and replicates the classic creamsicle flavor with fresh ingredients. The hardest part of this recipe is that you need to freeze your banana ahead of time. Place all your ingredients in your blender on the highest setting and blend until smooth, about 1 - 2 minutes. Emergen-C really kicks this smoothie up a notch. It is packed with 7 B vitamins, Zinc and Manganese - which are antioxidants, electrolytes and vitamin C. I have been a fan of the product since back when I was in college. During the winter months it gives me peace of mind to have Emergen-C as part of my regimen. I feel fortified when I drink it. It's an easy way to take vitamins. The Super Orange flavor fits great into this smoothie but there are 20 flavor varieties available. I grabbed my Emergen-C from Walgreens. Check out more Emergen-C recipes HERE. That looks awesome! I never thought to put Emergen-C into my smoothies. Brilliant! This does look tasty. I know what I'm making this weekend! I love creamsicle anything, this looks amazing. That looks super yummy and refreshing! YUM! 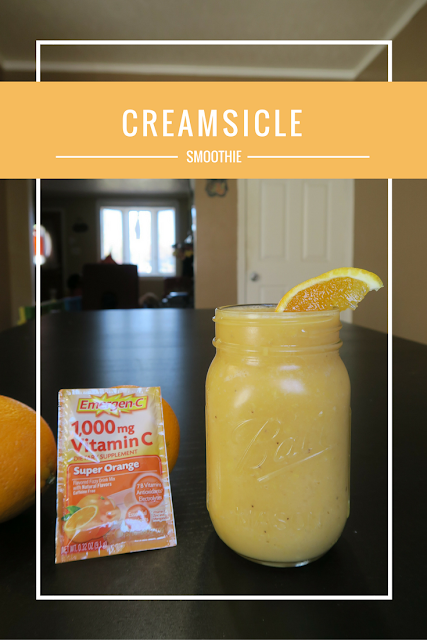 Love a creamsicle - what a great idea for a smoothie!